Add digital optical surround sound to your computer through PCIe. With this 7.1-channel PCIe sound card, you can create a high-quality home theater sound system. It offers SPDIF input and output ports which deliver crystal-clear digital optical audio, for the ultimate listening experience.The versatile sound card can be used with a variety of audio devices. And with SPDIF digital optical or 3.5mm analog output, you don't need to worry about the connection types on your devices. You can output digital audio to your optical receiver or DAC, or analog audio to your sound system.With up to 24-bit and 192KHz playback and recording, this 7.1 surround sound adapter card delivers high-definition audio for superb sound quality.Unlike typical sound cards, this card is designed to fit in low-profile computers, making it ideal for home theater personal computers (HTPC). It spans the multiple ports across a main card plus an innovative separate header bracket. The card is configured with standard profile brackets and includes low-profile (half-height) brackets.The 7.1 channel surround sound card is easy to install. It's perfect for anyone looking for a simple solution to upgrade their listening experience, such as music enthusiasts or mixing professionals.For added scalability, you can quickly connect a microphone or other recording devices to your computer through two 3.5mm stereo or SPDIF digital audio input jacks. The versatile sound card can be used with a variety of audio devices. And with SPDIF digital optical or 3.5mm analog output, you don’t need to worry about the connection types on your devices. You can output digital audio to your optical receiver or DAC, or analog audio to your sound system. Unlike typical sound cards, this card is designed to fit in low-profile computers, making it ideal for home theatre personal computers (HTPC). It spans the multiple ports across a main card plus an innovative separate header bracket. 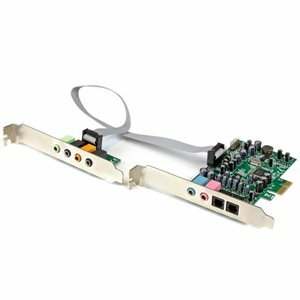 The card is configured with standard profile brackets and includes low-profile (half-height) brackets. The 7.1 channel surround sound card is easy to install. It’s perfect for anyone looking for a simple solution to upgrade their listening experience, such as music enthusiasts or mixing professionals. The PEXSOUND7CH is backed by a StarTech.com 2-year warranty and free lifetime technical support.